Throughout the various species of the order Neuroptera (the net-winged insects), larval carnivory is nearly a cut-and-dried rule. There are parasitoids of other insects (Mantispidae) and some (Sisyridae) attacking freshwater sponges, of all things; yet they evolved from carnivorous ancestors, as the larvae of the mantispid subfamily Calomantispinae show (being still predatory). Adults (if they feed at all) universally retain this carnivory, with the owlflies (Ascalaphidae) truly formidable aerial hunters; the only exceptions would be the extinct nectarivorous kalligrammatids and aetheogrammatids (Ren & Engel, 2008). But there are even dietary aberrations amongst neuropteran larvae: and all of them lie within the superfamily Ithonoidea, regarded as some of the least derived neuropterans; they are often placed as the sister group to the remainder of the suborder Hemerobiiformia (Aspöck, 2002; Aspöck & Aspöck, 2008)—and if that taxon contains the myrmeleontiforms (as some neuropterists suggest; Ponomarenko, 1992; Haring & Aspöck, 2004; Makarkin & Menon, 2005), the ithonoids would be second only to the Nevrorthidae (sole member of the Nevrorthiformia) as the basalmost net-winged insects. The superfamily consists of two extant families: the Ithonidae and Polystoechotidae; recent phylogenies have sometimes sunk the latter into the former (Winterton & Makarkin, 2010), but here I will consider them separate. In addition, the extinct Parakseneuridae can be placed in the group (Yang et al., 2012); a number of other Mesozoic families regarded as "psychopsidoids" (the Prohemerobiidae, Brongniartiellidae, Osmylopsychopidae, etc. ; Martynova, 1949) resemble the Ithonoidea (Riek, 1974; Yang et al., 2012), but their kinship to that taxon sensu stricto remains an open question. This taxonomic quibble is impertinent to the matter at hand: the ithonids and polystoechotids themselves, or the moth lacewings and giant lacewings, as they are referred to respectively in the vernacular. The latter are so named because of their prodigious wingspan of 55-65 mm. (in Polystoechotes punctata), and although most of their autapomorphies are plesiomorphic (e.g., nygmata* and trichosors† are present), their wing venation remains distinctive (Carpenter, 1940). Restricted nowadays to two discontinuous patches of land in the Americas (temperate North America southwards along the Mesoamerican mountains until the Cordillera de Talamanca; and central Chile) (Oswald, 1998), giant lacewings inhabited Eurasia as recently as the Paleogene Period; and the Triassic Lithosmylidia, the earliest known genus referable to the Polystoechotidae, hailed from Australia: although it, or at least those species it contains aside from L. lineata (Lambkin, 1988) (if not all of them) may actually belong to the unrelated Archeosmylidae (Makarkin et al., 2012). Overall, their preferred habitat would seem to be moist, mesothermic‡ woodland. Moth lacewings encompass a greater scope of lifestyle, but each taxon seems rather strict in its preferences. Three genera are distinctly inhabitants of arid climes: Varnia is only known from scattered localities in central and southwestern Australia (mostly in the vicinity of the Simpson Desert), the monotypic Oliarces is restricted to the Sonoran and Mojave Deserts of southwestern North America, and Ithone is widespread across xeric regions of Australia; the remainder of moth lacewings flutter in moist tropical to temperate upland forests in Mesoamerica, Queensland, and New South Wales (Tillyard, 1919; Riek, 1974), with one genus (Rapisma, until recently classified in its own family; Penny, 1996) living throughout Indochina (Makarkin & Archibald, 2009). Although their scattered distribution would imply antiquity, fossils identifiable as moth lacewings are rarer than the remains of their "giant" cousins (Makarkin & Archibald, 2009), with the oldest one being approximately 105 million years younger than the aforementioned L. lineata (Gradstein et al., 2004; Jepson et al., 2009). Neither of these families are terribly common—Narodona (Ithonidae) is known from only a single specimen from Colima (Navás, 1930)—and the tendency of neuropteran larvae to be less conspicuous than conspecific adults (myrmeleontids are a notable exception) is, alas, also true of these lacewings. After the first scientific description of an adult ithonoid, a full 121 years elapsed before a larva belonging to that superfamily was (literally) unearthed. The first-instar larva of P. punctata turned out to be campodeiform, as is typical of neuropterans; thus, neuropterists naturally assumed that it, like all the rest, was carnivorous (Welch, 1914). 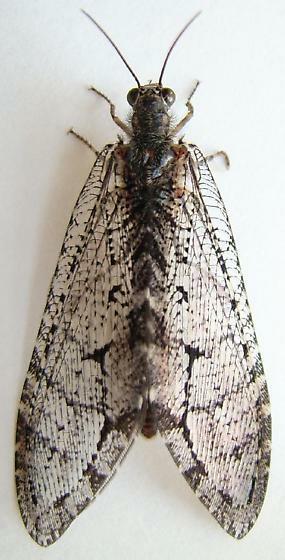 The first hint that ithonoids were far from conventional as larvae came with the description of the final larval instar of the moth lacewing Ithone fusca: it was pale, blind, and C-shaped—in other words, scarabaeiform; a condition found elsewhere among the Neuroptera only in later instars of the Mantispinae (Imms, 1957). Still, I. fusca's status as a subterranean predator was taken for granted (Tillyard, 1922). Lastly, I must reiterate that we remain largely ignorant of ithonid and polystoechotid ecology. Consider the United States' only ithonid, Oliarces clara: its grubs (Grebennikov, 2004) are never found away from creosote bushes (Larrea tridentata)—but since females seemingly deposit their greenish eggs (500 per brood) on the sand at random, how do hatchlings find their way to their (presumptive) host plant? And this lacewing is by no means rare: the short-lived adults, which eclose simultaneously cicada-style sometime between mid-April and mid-May, have been recorded as occurring in densities as great as 250,000 individuals per acre (Johnson, 1992). This lack of knowledge has done little good for the giant lacewing first described scientifically, Polystoechotes punctata (Fabricius, 1793): widespread across North America south of 56°N until World War II, by 1950 it had vanished from the continent east of the Rocky Mountains, a region where it was hitherto common. Nobody knows the cause of its disappearance—invasive ground beetles (Carabidae)? Light pollution? Wildfire suppression?—nor the reason for that event's chronological and geographical placement (P. punctata thrives to the present day in suitable habitats west of the Continental Divide, as photographic evidence on BugGuide attests) (Marshall, 2006). Determining the solutions to this puzzle would be useful not just to neuropterists, but to anyone researching the United States' biotic history; and until we are so enlightened, our understanding of how our species has affected Earth's biosphere will be sadly incomplete. *Sensory patches/bumps on insect wings, especially those of Neuroptera. †Hairy, thickened portions of neuropteran wing margins. ‡Featuring mild temperatures with little variation. Aspöck, U.; Plant, J. D.; and Nemeschkal, H. L. (2001). Cladistic analysis of Neuroptera and their systematic position within Neuropterida (Insecta: Holometabola: Neuropterida: Neuroptera). Systematic Entomology, 26, 73-86. Aspöck, U. (2002). Phylogeny of the Neuropterida (Insecta: Holometaboloa). Zoologica Scripta, 31, 51-55. Carpenter, F. M. (1940). A Revision of the Neararctic Hemerobiidae, Berothidae, Sisyridae, Polystoechotidae, and Dilaridae (Neuroptera). Proceedings of the American Academy of Arts and Sciences, 74, 193-280. Faulkner, D. K. (1990). Current of the biology of the moth-lacewing Oliarces clara Banks (Insecta: Neuroptera: Ithonidae). Advances in Neuropterology. Proceedings of the Third National Symposium on Neuropterology, Pretoria, RSA; pp. 197-203. Gradstein, F. M.; Ogg, J. G.; and Smith, A. G. (2004). A Geologic Time Scale. Cambridge: Cambridge University Press. Johnson, R. (1992). Cheese-weed owlfly (Oliarces clara). Unpublished short abstract for United States Fish & Wildlife Service. Phoenix: Arizona Ecological Services. Lambkin, K. J. (1988). A re-examination of Lithosmylidia Riek from the Triassic of Queensland with notes on Mesozoic "osmylid-like" fossil Neuroptera (Insecta: Neuroptera). Memoirs of the Queensland Museum, 25, 445-458. MacLeod, E. G. (1964). A Comparative Morphological Study of the Head Capsule and Cervix of Larval Neuroptera (Insecta). Unpublished PhD thesis, Department of Biology, Harvard University, Cambridge, Massachusetts. Martynova, O. M. (1948). 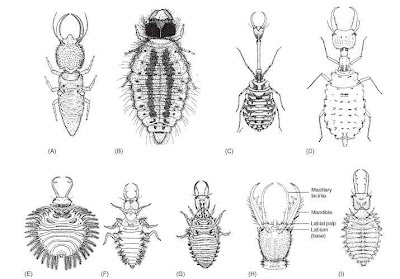 Mesozoic lacewings (Neuroptera) and their bearing on concepts of phylogeny and systematics of the order. Trudy Paleontologicheskogo Instituta Akademii Nauk SSSR, 7(1), 1-232. Navás, L. (1930). Insectos neotropicos. Revista Chilena de Historia Natural, 33, 17-24. Oswald, J. D. (1998). Rediscovery of Polystoechotes gazullai Navás (Neuroptera: Polystoechotidae). Proceeding of the Entomological Society of Washington, 100, 389-394. Penny, N. D. (1996). A remarkable new genus and species of Ithonidae from Honduras (Neuroptera). Journal of Kansas Entomology, 69, 81-86. Ponomarenko, A. G. (1992). Neuroptera (Insecta) from the Lower Cretaceous of Transbaikalia. Palaeontological Journal, 26(3), 56-66. Ren, D. and Engel, M. S. (2008). Aetheogrammatidae, a new family of lacewings from the Mesozoic of China (Neuroptera: Myrmeleontiformia). Journal of the Kansas Entomological Society, 81(3), 161-167. Riek, E. F. (1974). The Australian moth-lacewings (Neuroptera: Ithonidae). Journal of the Australian Entomological Society, 15, 37-54. Tillyard, R. J. (1922). The life-history of the Australian moth-lacewing, Ithone fusca (Order Neuroptera, Planipennia). Bulletin of Entomological Research, 13, 205-223. Welch, P. S. (1914). The early stages of the life history of Polystoechotes punctatus Fabr. Bulletin of the Brooklyn Entomological Society, 9, 1-6.